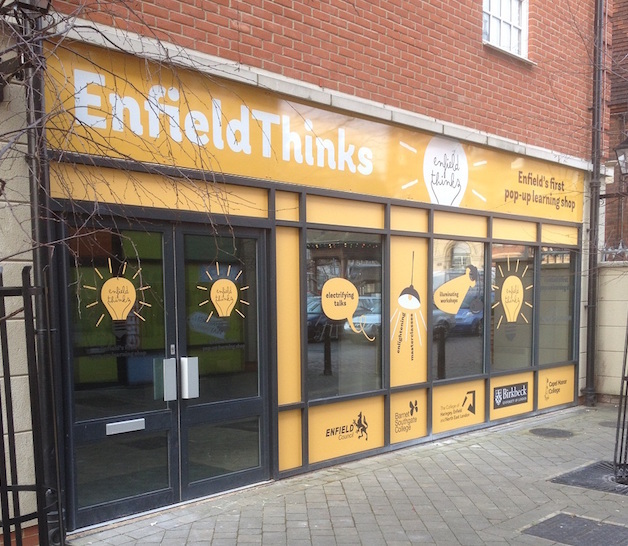 EnfieldThinks pop-up learning shop opens in Enfield Town on 7 April offering over 250 free courses and events over three months. There are GCSE revision sessions, courses on emotional wellbeing, financial management, first aid and social media; workshops on how to get into film or theatrical make up; events giving information about apprenticeships and traineeships and opportunities to learn about things as diverse as trees, building, hair and beauty and horticulture. You'll find EnfieldThinks up on Burleigh Way, a short walk from both Enfield Chase and Enfield Town train stations. While in Enfield we recommend you visit the Dugdale Centre for Enfield Museum, find the New River (PDF) and seek out the blue plaque to the UK's first cash machine near the historic Market. Visit EnfieldThinks online for more information and to book your place on these free sessions.